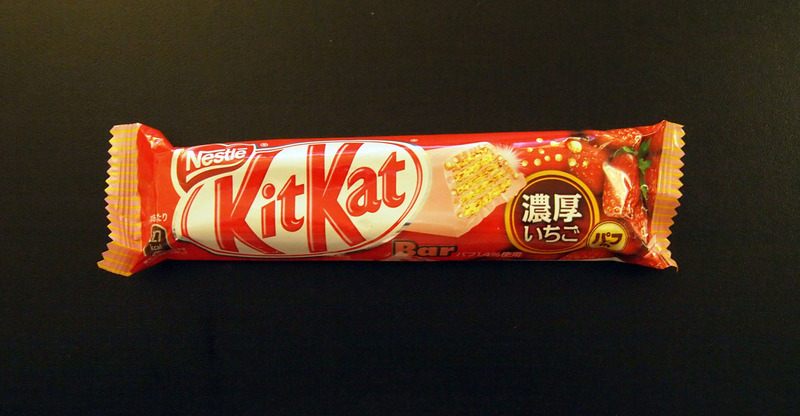 Review: Kit Kat Rich Strawberry Puff-In | Oyatsu Break! 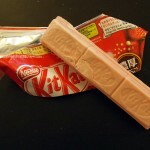 I love fake Strawberry flavours, and Kit Kat Strawberry in particular. 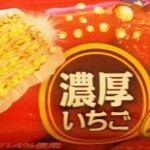 I follow a bunch of Japanese snack food blogs and they tend to follow the same refrain: We’re bored of strawberry! I get it, I do, but not me. I find that to be the same as saying I’m bored of chocolate, you know? It’s a core flavour, and open to any number of interpretations, however slightly different from the original they might be. Which brings us to: Rich Strawberry Puff-In! The anticident to the Air-In Kit Kat, these feature little rice puffs–like mini Rice Krispies–layered inside the chocolate… er, strawberry-flavoured white chocolate coating. The description promises a sweet-and-sour strawberry experience, mixed with big crunch. I’m excited! 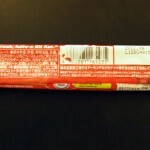 Packaging: Bright red Kit Kat packaging with clear product illustrates what’s inside, though the writing entirely in Japanese isn’t terribly helpful to me… :-(. 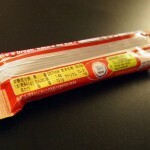 Still, It’s strawberry bar with puffs in it, that much is illustrated, and a little bit of Google-fu revealed at least the jist of a translation of the text. Scent: As expected, it has a strong, artificial strawberry scent. It’s good stuff if you like it, but I imagine it’d be a huge turn-off if you don’t. 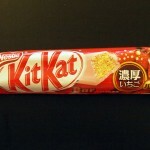 It does smell a little bit richer than some of the other strawberry Kit Kat I’ve had, which is pretty exciting. I wouldn’t go so far as to say “sweet and sour”, but it’s lovely. Taste: Unfortunately the bar didn’t survive the trip back from Japan 100% intact, and it’s a bit crushed and a bit melty, so take my observations with a grain of salt here. 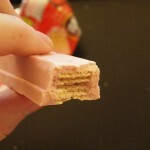 Taking a bite from the middle, I’m surprised that the taste of the wafers and the rice puffs is so much stronger than the strawberry! 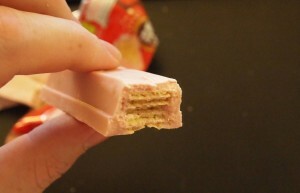 It’s one of the most wafer-tasting bars I’ve had, on first bite, though as I continued chewing the flavours did even out a little bit more and the strawberry came back up. It’s not a super-strong strawberry taste, but it’s certainly not bad. It’s only 30 seconds after your bite that the flavour really kicks in, as the aftertaste is a very tart, sweet hit. The corners of my mouth lit up with flavour, and that’s a pretty neat trick! The bite of the end (there’s much more chocolate coating on the end) is a lot closer to what I expect from a Strawberry Kit Kat, and the flavour is pretty standard once the chocolate/wafer ratio is worked out. The more you eat, the more the sourness kicks in as well, which is really elevates it as a whole. Verdict: I’m really mixed about this. I tried to go in with an open mind, but as usual, I find that the Kit Kat Bar’s just don’t have the right mix of chocolate and wafer, it’s all out of whack, and it negatively affects the overall taste of the bar. But the sour strawberry bits are awesome, and once those build up it’s right up there with some of the best tasting bars. It definitely leaves you wanting more, but I do feel a bit tricked into thinking that because it didn’t get great until the last few bites. I’m happy to try it and I’d buy it again, but only if there was nothing new on the shelf.